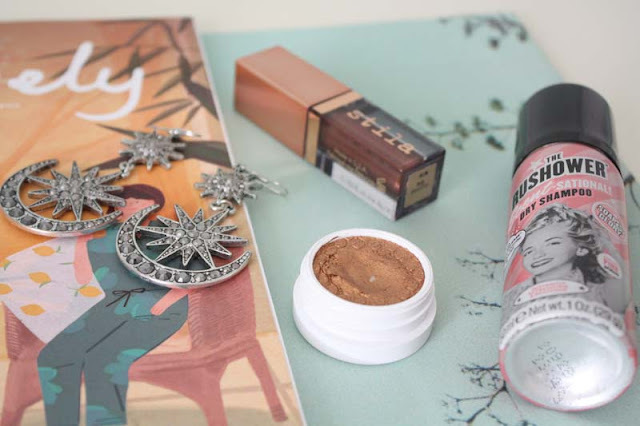 -Bronze Eyeshadow: Bronze glittery eyeshadow is my makeup MVP. I've literally been gravitating towards this tone of eyeshadow alone all month. Probably spurred on by this makeup look. It could also be the slight Autumnal crispness to the air that is drawing me to these colours as well. There's no specific eyeshadow I've been reaching for over another but stand-outs have been this, this in the shade Twig and this palette. -Rushower Dry Shampoo x Soap and Glory: This is good, inexpensive stuff. Hey-if it makes my hair smell good and kinda disguises the hair washing laziness, I am not going to complain. This mini can is cheaper than a takeaway coffee, where I frequent at least, and the larger can is only $7 so it's not going to set you back a lot. A++ would recommend. 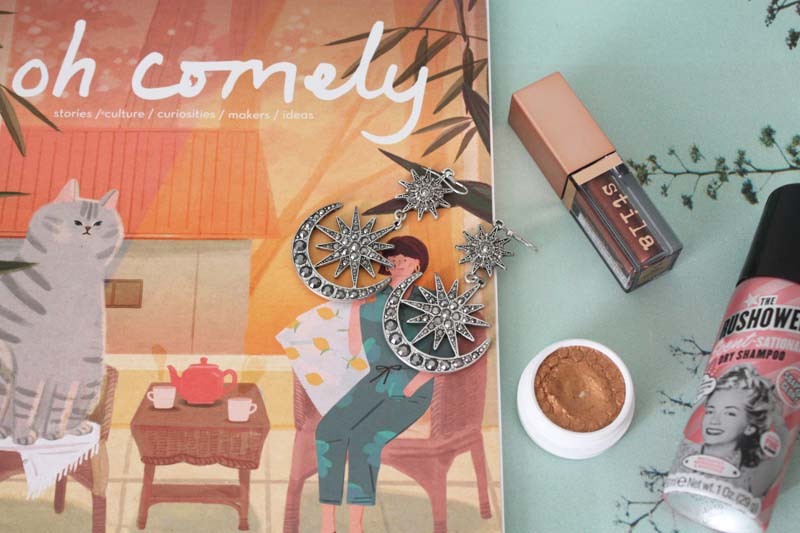 -Oh Comely magazine: I have a lotta love for this independent British title. It's packed full with brilliant stories, imagery, women, books and just a whole bunch of goodness basically. Like my beloved frankie, it's released bimonthly and also like frankie, it's a magazine best savoured over several readings. As I'm a bit behind on magazine reading I had two issues of this to read this month and loved them both. Roll on April because another issue is released then. -The Fringe Of It Podcast: Sorry not sorry for mentioning this podcast again. Liv+Charlotte in a podcast=a whole lot of brilliant banter and ideas. Each episode they talk about what they've been watching and buying and then they move into a themed discussion. The two most recent episodes have looked at getting out of a funk and style. The podcast is on a lil' break at the moment while Liv is in New Zealand(!!) but there's plenty to listen to while you wait if you need a catch up. -Lovisa Earrings: I like my celestial jewels, that's not new information for anyone. I've been wearing these ones a bunch recently, until I can fork out for something a bit fancier. Despite their appearance, they're surprisingly lightweight and I love 'em. If only for the fact it makes me feel like I'm channeling Stevie Nicks a bit whenever I wear them. -The Unabridged Journals of Sylvia Plath: This hefty tome has been carted everywhere with me. I'm still not finished and because I like to dip in and out of it, reading it will probably take a while. Sylvia's writing is so captivating and profound in many ways. She does like the odd grotesque metaphor which did take me a bit of getting used to. I wish I could quote something memorable from it but the one line staying with me right now is her aside about an ex's new girlfriend, in which she called them a "brilliant whore". In seriousness, I do have many passages underlined and will collate my thoughts about this book into something more cohesive when I do eventually finish it. -Rekorderlig Elderflower & Lime Cider: First off, not sure how many youths are reading this blog *waves*, please drink responsibly. Everyone else, you need to try this cider. I had a glass post Round the Bays at The Glass Goose and it is divine. Not too sweet, not too bitter and mighty refreshing. Bold claim but this might be my favourite Rekorderlig flavour. In fact you can bet I'll be celebrating the end of the short working week with one of these tomorrow.